The Pacific Northwest is rainy. Lots of clouds. The Amazon offices are also in the Pacific Northwest—in Seattle, to be exact. Like other giant tech companies, Amazon created a cloud so we can pay them to store data. 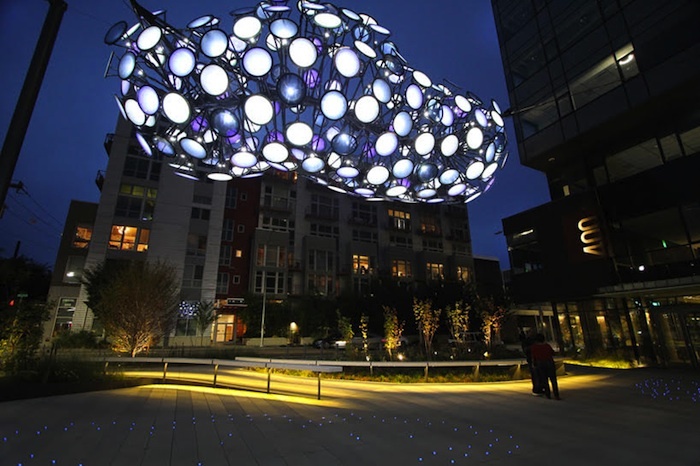 To celebrate this transition from our “our analog hard copy world and local computer storage” to a “cloud-based system,” multimedia artist Dan Corson has created Nebulous, a public art sculpture of two large, pixelated cloud forms. 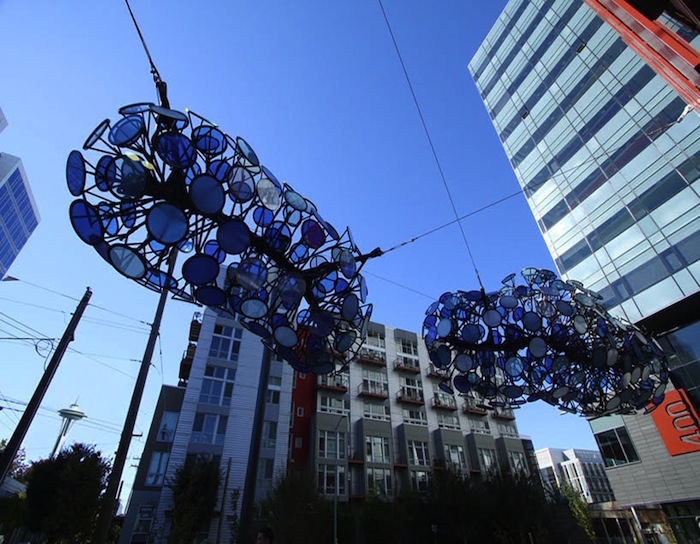 Located at Amazon’s Seattle campus, these two “low-res” cloud forms—which are neither fully transparent or opaque—are made of a variety of colored glass, transparent conducting film, aluminum, photovoltaics, LEDs and other electronic components. Switch-glass panels designed via parametric modeling form the skin of the cloud-inspired sculptures. Nebulous from Dan Corson on Vimeo. “These ‘low-res’ clouds have select glass discs that shift between levels of opacity in a digital dance resembling old school calculating computers or perhaps pulsing lightning within clouds on a stormy night,” he adds. Nebulous is now visible outside of Amazon’s Seattle campus. Click here to see more of Dan Corson’s work.